right, both put in career-best best performances on a rain-affected second day at the Vierumäki Finnish Challenge. Scottish left-hander McIntyre took the early clubhouse lead with a five under par round of 67, before Välimäki stole the show on his European Challenge Tour debut. 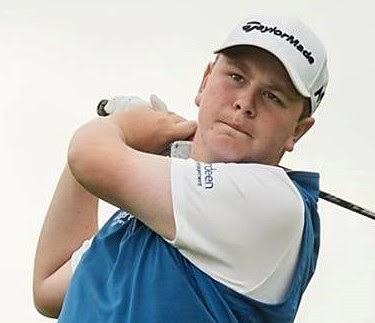 The 19 year old Finn, carded an eagle and seven birdies on route to a seven under par 65 in only his second round on Europe’s top developmental tour. With heavy rain causing a four-hour delay, many players were left unable to complete their second rounds, but both Välimäki and McIntyre go into the weekend full of confidence after excellent 36-hole displays. McIntyre, who failed to make the cut in his other two appearances on the Road to Oman this season, was also delighted with how he played – and credited competing on Scottish links courses for helping him tackle the damp conditions. “Being an amateur you have to play in difficult conditions on links courses – that definitely helped me today,” said the 21 year old, whose appearance this week is just his fifth on the Challenge Tour. “I had nothing to lose and everything to gain so I made sure that I didn’t get too down on myself about the weather – it was a good day. “I putted really well. I hit it good as well – you can’t score like that without striking the ball well. Overall my game is in good shape and I’m hoping I can carry it on over the weekend. “There was a different wind today compared to the last two days. I had to focus more on the wind. Despite the rain I’d say that it was actually a little bit easier out there today. “Playing at this level is obviously a step up for me, and I’m starting to build up a little bit of experience. The two other events I’ve played in, especially the match play event in Spain, have really helped me. Välimäki finished the day four ahead of McIntyre (71-67 for 138) on ten under par overall. The young Finn goes into the weekend one behind Sweden's Christofer Blomstrand, who followed up an opening round of 68 with a 65 to reach seven under overall.